- There's no essential plot or exposition in this episode that renders it unskippable, but it's definitely a fun ride! 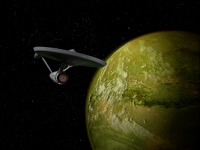 - The nation in which Earth resides is retconned away from various previously used terms such as "United Earth" to the more generalized term "The Federation" in this episode. - There are frequent references in this episode to the uncharted "solar system" ahead. This is a common error. The term they were looking for is planetary system. The planetary system we live in is called the Solar System because our star is named Sol. As such, the term "Solar System" is a proper noun, not a generic term. - At one point Kirk mistakenly refers to the planet he fights the Gorn at as an asteroid. - When Kirk finds the sulfur he utters a line to the recorder without moving his lips! 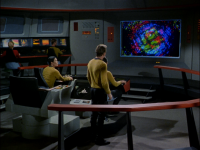 - This episode establishes that the Enterprise is capable of warp 7 and warp 8 but only at great risk to the ship. 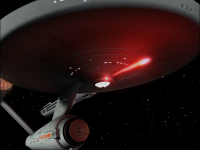 - William Shatner (Kirk) and Leonard Nimoy (Spock) both suffered from tinnitus as a result of being too close to an extremely loud special effect during the filming of this episode. - Kirk and company beaming down into a battle. - The space race pushing the warp engines to their limit. - Kirk being transported down with the Gorn by the Metrons. - Kirk attempting to fight the Gorn strength against strength and utterly failing. - The Gorn communicating with Kirk. - Spock figuring out what Kirk is planning and kind of keeping it to himself much to the annoyance of McCoy. - Kirk constructing a bamboo cannon. Awesome! 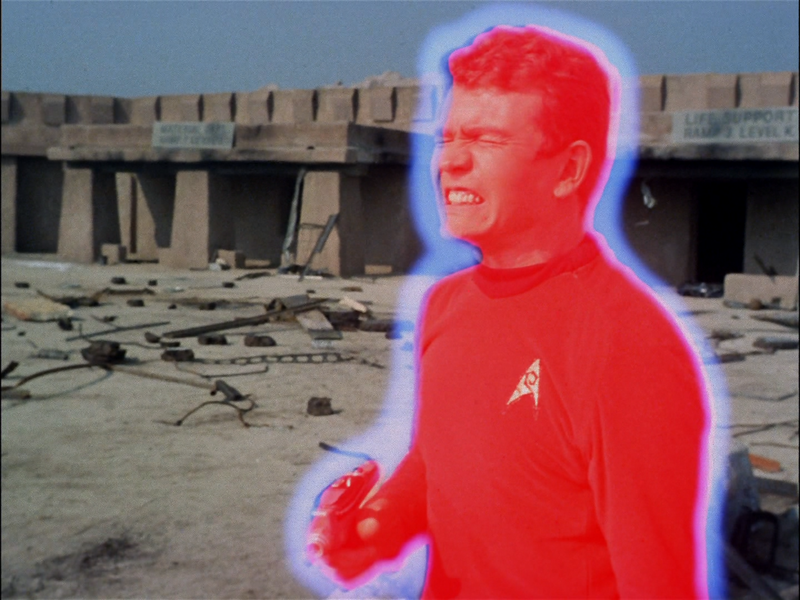 - Kirk firing diamonds into the heart of his enemy. - Kirk showing mercy on his enemy and refusing to deal the final blow. - Kirk: "We're a most promising species, mister Spock, as predators go. Did you know that?" This exciting and fast paced story could have been as good as Balance of Terror were it not for a few bad choices in terms of aesthetics and plotting. The most annoying detail is that we're introduced to yet another god-like alien race: the Metrons. How many of these are there in the Star Trek universe? The second most annoying detail is the one-dimensional way in which the Gorn are presented. Unlike the Romulans, the Gorn are pretty much just sneering, growling, hissing monsters and don't really have much depth to them beyond the surface. 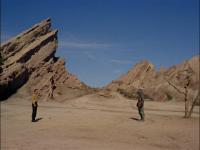 A better episode would have allowed the conflict between Kirk and his Gorn counterpart to emerge organically rather than using the super lame super aliens to set up the duel. Likewise a better episode would have fleshed out our Gorn characters a bit more. I like the idea that they probably thought they were merely acting in self defense, but something more nuanced would have been more interesting. One detail I enjoyed quite a bit was Kirk's bamboo cannon. While the bamboo cannon was well within the bounds of realistic science, don't try it at home kids, because there are many risks associated with trying to slap together something like that. Firstly, Kirk's bamboo shaft must have been unusually strong because most ordinary bamboo shafts used in this way would shatter in all directions from the explosion rather than directing most of the explosive force at the diamond projectile as intended. Likewise, Kirk's charcoal must have been some pretty potent stuff, unlike what you'll find for use in grilling steaks. In short, Kirk got pretty lucky. If the materials he found weren't sufficiently well suited for this little science project, his bamboo cannon easily could have injured or killed him instead of his opponent. That said, the Metrons picked this planet for the duel for a reason and I find it hard to believe the bamboo cannon wasn't within the bounds of their imagination. 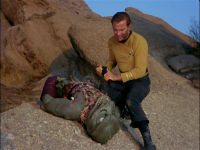 Kirk showing mercy on the Gorn at the end was a great detail and nicely demonstrates the spirit of Star Trek. If we didn't have the Metrons getting in the way of the plot, a better ending could have depicted Kirk showing mercy on the Gorn at the end as a means to open diplomatic negotiations regarding the status of Cestus III. I imagine the Gorn would be compelled to cede the world to the Federation as some sort of penance for their ruthless surprise attack. The Federation would in turn be prohibited from making any further incursions into territory claimed by the Gorn. Unfortunately that much better ending full of space politics and treaty negotiations isn't at all what we got. What we got instead was a bunch of vague philosophizing about humanity's promise and potential. Nevertheless it's not a bad story though. Certainly one of the better ones so far. After much lamenting of kethinov about human looking aliens with minonr cosmetic or no visual differences at all finally we get a reptilian hissing barbarian! It may look like a fake guy in a foam suit to our CGI spoiled minds 40 yrs later but dammit in 1967 TV this was hot! I enjoyed the Gorn hissing & chuckling to himself while he laid traps, his slow but unrelenting brutishness & this ep was also originally penned by the great scifi writer Frederic Brown. The enduring theme of this simple combat piece was you may encounter enemies whom you may want to hate & destroy in anger & revenge but even they may have legitimate reasons behind their violence. The metrons were portrayed by an androgynous girly dude but after 1500 yrs alive I would consider primitive sexual appearances rather pointless as well...lol. Factoid: Both Shatner & Nimoy suffered for years from tinnitus (chronic ringing of the ears) from pyrotechnics explosions that went off next to them in the Cestus III scenes. I used to agree with your opinion that there are too many all powerful beings on TOS. Then I remembered Who Watches the Watchers and I changed my mind. Picard's line is something like, "any sufficiently advanced race would seem all powerful." In this context, I think all of the supposedly all powerful beings are well used in TOS. It stands to reason that there are many races that are far more advanced than we are, and using Picard's logic, they would appear to be all powerful. 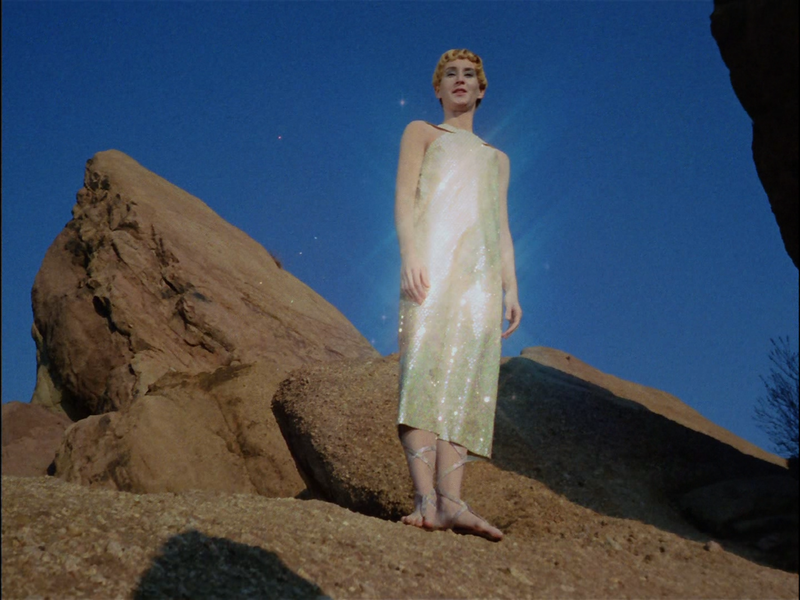 Therefore, I dont think the multitude of "all powerful beings" on TOS is misplaced in the Star Trek Universe. What do you think? I loved this episode when I was a kid. Watching it again as an adult, the execution of the episode seems more awkward than I remembered, but it is still a classic. - The sluggishness of the Gorn doesn't bother me. 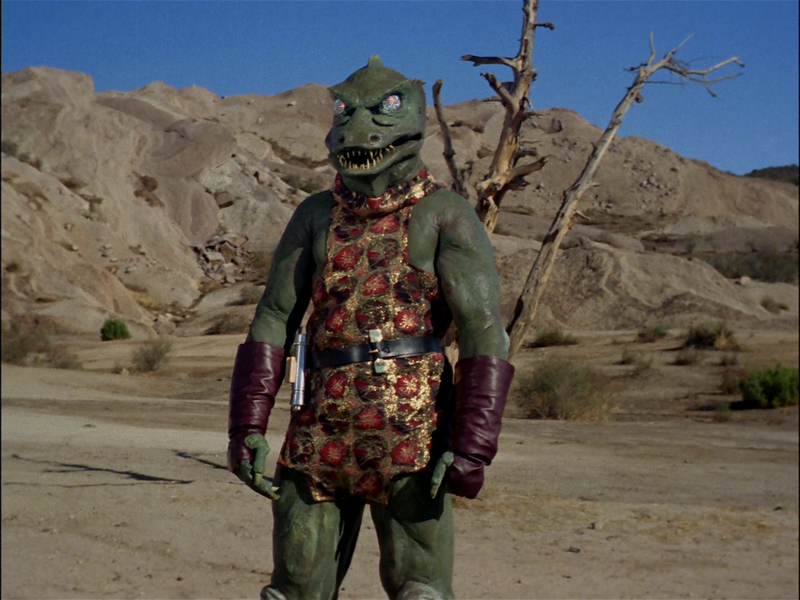 The concept is that the Gorn has much greater strength and toughness, the human much greater speed. - You are right that the scene where the Gorn removes the rock from Kirk, letting him escape, is quite strange to watch. 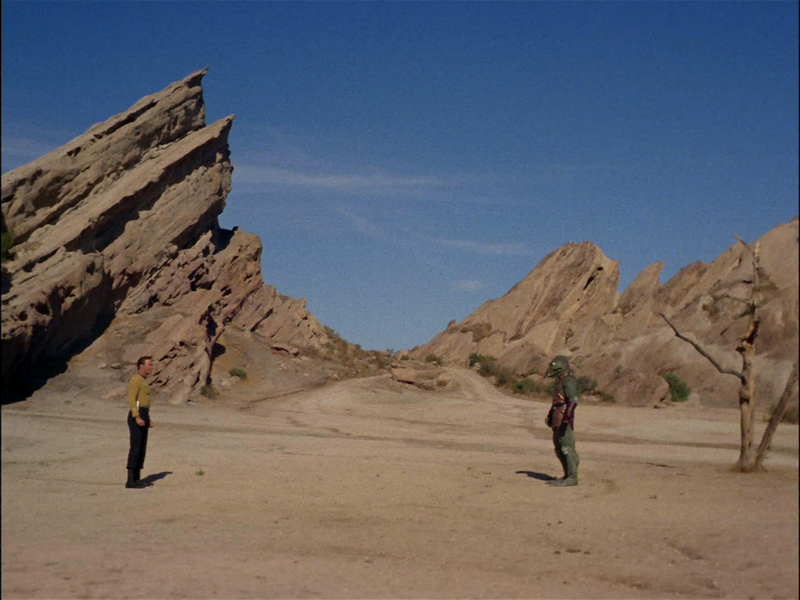 Maybe the Gorn made a mistake in the heat of battle because he instinctively assumed his foe could remove the rock at any time and was just going to use it as a trick of some sort. - Kirk’s final solution is cool. But we've seen the Gorn survive being buried under a falling rock that must weigh several tons, and keep going. I found it somewhat challenging to believe that a creature with such comic-book toughness could be killed by Kirk’s silly improvised weapon, at a distance, while Kirk's fragile human body, at point blank range to the explosion, is unharmed. As you mention, those materials must have been just perfect for the job. - Although it seems a shame we learn so little about the Gorn, I believe this may be necessary. At the end of the story, much of the force of Kirk’s morality is his decision to spare an opponent he knows little about and who has repeatedly tried to kill him. If the audience had been given enough back story to already be sympathetic to the Gorn, that scene would lose much of its effect. 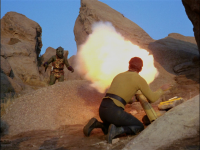 - The Gorn seem to be rather ineffective at the art of war. They trick the Enterprise crew into beaming down into a trap. But the trap is pathetic, just a weak, ineffective mortar barrage that does little more than scare the landing party. 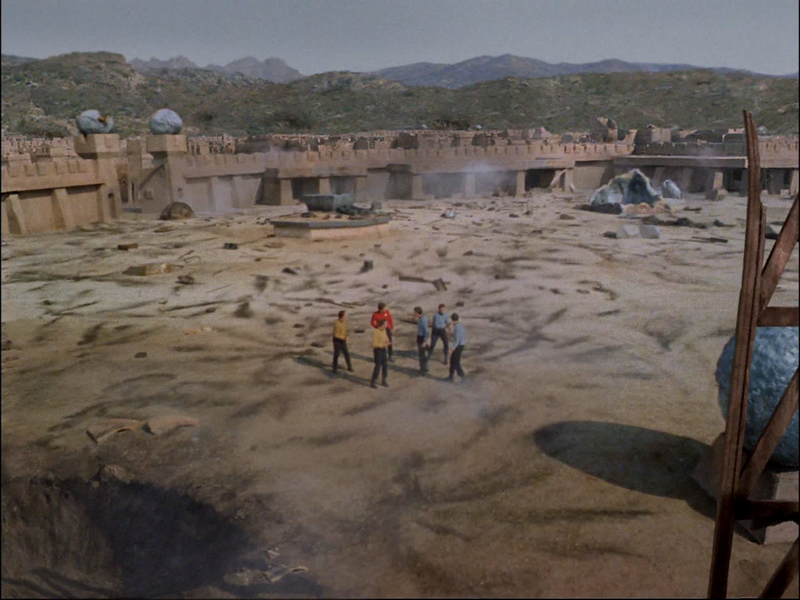 Kirk then responds with a Federation mortar of enormous power. If the Gorn had an equivalent weapon – or even taken the Federation weapon when they destroyed the colony earlier – or laid a booby trap, or just done anything effective – Kirk would have been killed. 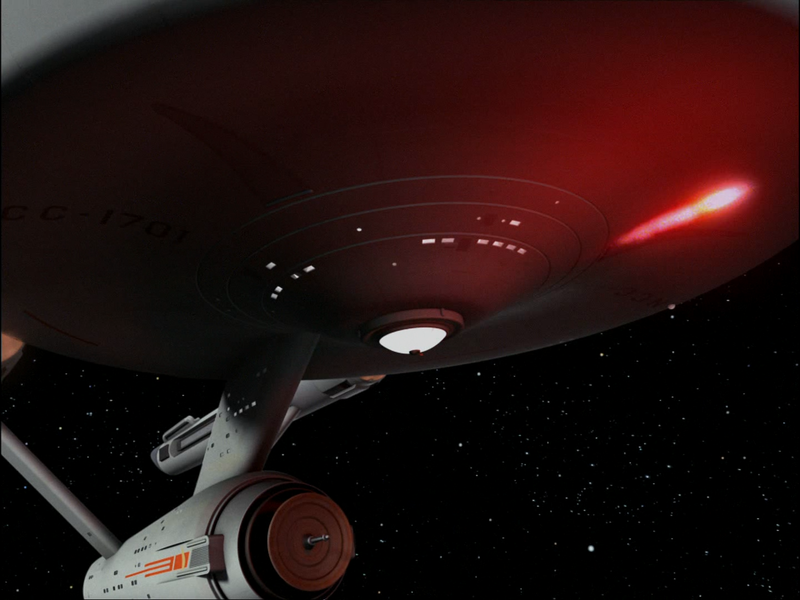 Then again, the Enterprise really should have been able to detect that Cestus III was destroyed before Kirk beamed down. 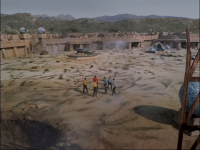 It seems they really wanted to film a scene of Kirk beaming down to a destroyed base while bracketed with explosions, whether it made sense or not. And it was a pretty cool scene! Why has Sulu got that ridiculous slick of hair on his forehead? What is he thinking? Even when the Enterprise is in danger of imminent destruction he continues with his absurd new look. I'd like to see the Metrons take on the Providers from 'Gamesters of Triskilion'. See how they like it. Having said all that it's a great episode and just shows how better things were before CGI. Nothing ever looks quite right to me with CGI. Once again the deaths of hundreds of people seems to be no big deal. Couldn't the gorn (gorns?) have tried explaining to the outpost that they were trespassing before wiping them out? I certainly wouldn't be falling over myself to invite them into the Federation. Problem: Or rather just odd. The Metrons are remarkably adept at covering, dramatizing, and producing steady in focus shots of live events with multiple 2D invisible cameras. "Well no, not really. most aliens I've meet lately look a lot like humans and some of them look like kids"
I'm a little puzzled by the Metrons' rationale for all this. Instead of letting our heroes and the Gorns fight it out for themselves, the Metrons have the captains fight it out man-to-Gorn, and they will destroy the ship of the loser. Either way there will be death and destruction. The only differences are that 1) the death and destruction will be on only one of the two sides, and 2) we get a show out of it. How is their option any more civilized? Well, maybe there will be a little less death and destruction their way, and perhaps quicker, more merciful deaths. Still. Contrast this to what the Organians did in "Errand of Mercy". Why didn't the Gorns put up a NO TRESSPASSING sign? Why didn't they go to Cestus III and say, "Uh, excuse me? This is our place. Would you kindly pack up your stuff and leave?" Or, they could have charged rent! It must have taken a considerable amount of time to set up Cestus III. Where were the Gorns then? When Kirk launches the blue grenade, he aims it to his left while Kelowitz says the enemy is to his right, or did I miss something? Maybe the launcher puts a wicked spin on the blue ball? Regardless, it looked and sounded pretty cool when it went off! The (unexploded) blue balls looked pretty cool, too. How did the ships transport their crews up when they were at an extreme distance from Cestus III? I really didn't like this. Spock is on his respect-for-sentient-life kick again. Kirk is right. You don't let murderers walk free just because it won't raise the dead. I don't know why, but the Gorn works as a scary opponent for me. Maybe it's the "sneering, growling, hissing" noises he makes. Whatever it is, I think he looks pretty cool. Oh, I love the expression he makes when the big boulder is about to clobber him! Speaking of the big boulder, how did Kirk aim it so accurately? I'm not certain I understand the motives of the Metrones. It sounded like to me their goal was to stop interference. I assume this means alien interference with the Metrones; either from the Federation or the Gorn. I can think of several ways better than the one they chose to accomplish this goal but really, how was anybody interfering with the Metrones in the first place? Had the Metrones simply let the two ships fly on by nobody would have interfered with them. And, if their was a goal to teach some sort of lesson, what was the lesson learned by a personal battle followed by the destruction of one or the other of the ships? And, of there was no lesson; just a 'less large' version of the ship to ship battle that was going on then the Metrones don't have much moral authority to begin with. I didn't explain myself very well but I just don't understand where the Metrones were coming from. But, never mind; this episode is a cult classic. You could put a picture of the rubber-suited Gorn right next to a Tribble or the Enterprise herself as an icon of the TOS franchise. 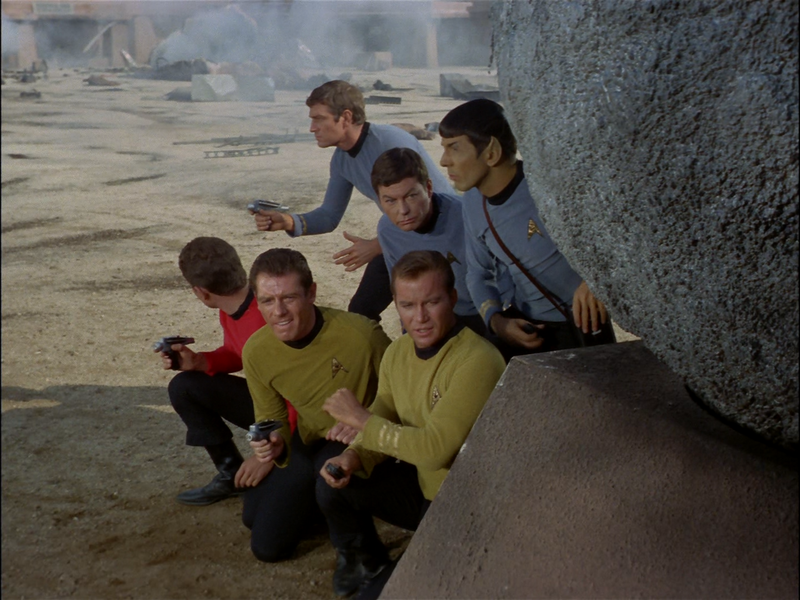 As with 'The Galileo Seven' Star Trek really needed to make their rocks heavier; at least heavy enough to keep from wiggling when touched. A light breeze would have sent them flying! I agree with nearly all of Kethinov's opinions here. Like many of these early episodes, this one had some strong elements, but also several missteps and missed opportunities. 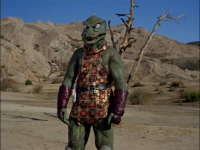 The look of the Gorn is goofy, to be sure, but I was willing to overlook that due to the effects and budget of the time. Once he starts moving and fighting, though, I had to laugh. How do these creatures react during a space duel between ships? Just pray that they don't have to make a fast turn? Pretty poorly thought out, that little detail. And once again, the godlike beings. This is now back-to-back episodes that feature such beings. Boring. Having one unimaginably powerful race of creatures as part of the mythos is very intriguing. When you start having two, three, and more, it starts to get dull. It's also a very weak plot device. Once again, though, a strength is seeing how Spock's reactions contrast with his very reactionary shipmates. I'm not fond of this one. There's plenty of good ideas, particularly the idea that the Gorn weren't in the wrong, but the arrival of the Metrons (aka, superior beings #473) really ruined for me. This classic episode is much more than filler, although the crew watching TV is a bit lame, there should have been another story thread on the ship, perhaps inadvertently caused by the Metrons, involving a 'ticking clock' situation to ramp up the tension even more. This episode is based on a classic short story by Frederick Brown. SPOILERS In that story, the 'Godlike' aliens realise that the two races will fight a long war and destroy each other. By intervening at least one race will survive. In the story, the human wins and has his memories of the Arena erased, The enemy ships all blow up and their race is extinguished, but the humans don't know why. There is a talking lizard in the story, but it is not the enemy. 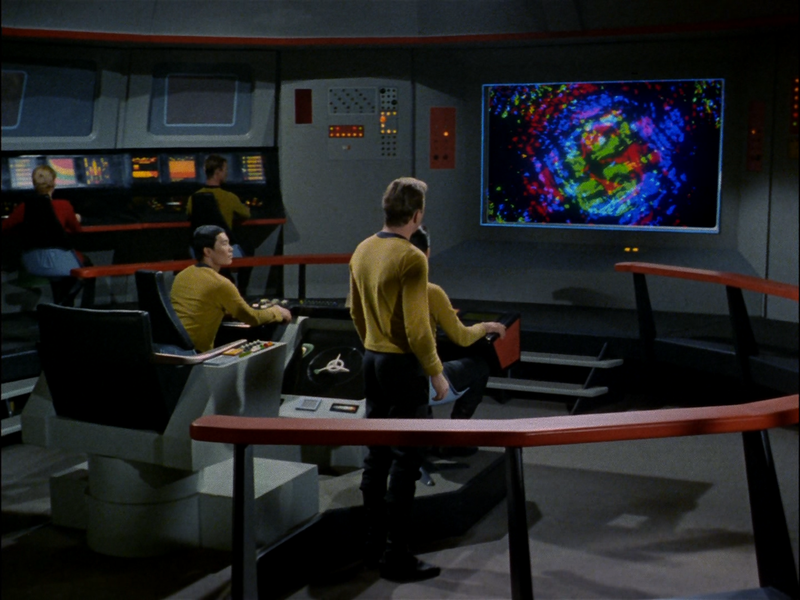 The Star Trek version improves on the original story by allowing Kirk to force the Metrons to allow a different outcome. That the all-powerful Metrons are portrayed by an apparently physically weak androgynous figure is a great move. (even if Trek does it too often). The opening battle was an excellent dramatic move, especially while the real war in Vietnam was unfolding nightly on the news. I grew up in Trinidad and Tobago and as kids, we made bamboo cannons all the time! They were awesome and could hurl tennis balls 100yds at least! Look them up on TouTube. Either way... there are a lot of problems with this episode aside from those mentioned! "Mercy is an 'Advanced Quality'"?!?!? Is this idiot serious?